BOOK NOW Our cabins have two rooms available for rent – one side is a standard room the other side is a deluxe room; open the privacy doors between each room you have the option to rent the whole cabin. Complimentary continental breakfast served in the Lodge each morning from Memorial Day Weekend through Labor Day Weekend. Rates do not reflect the 7% Lodging Tax. If a room is cancelled at least 24 hours prior there will be no charge. Less than 24 hours will result in a 100% charge. 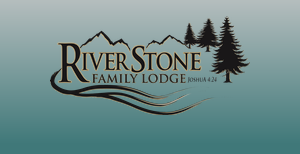 Charges are subject to RiverStone Family Lodge & Cabins discretion if we are able to rent the reserved room. Please see our full policy list for more information. One bed, full bath, hair dryer, coffee maker, iron & ironing board, satellite TV, telephone, heat, AC, wireless Internet. Rates are $129 per night, or $99/night during the off-season. Same amenities as the Standard Room but has two beds and includes a loveseat, small microwave, sink, refrigerator. Rates are $149 per night, or $129/night during the off-season. We have two Deluxe Bunk Bed rooms: #11 sleeps 7 people with a full over a queen & twin over full bunks; #13 sleeps 5 with stand alone queen bed & twin over a full bunk. The rates for either are $179 per night, or $149/night during the off-season. We have one standard bunk bed room; #12 sleeps 4 people with a full over a queen. Rates are $149 per night, or $129/night during the off-season. We have one standard room and one deluxe room for those requiring extra to accommodate wheel chairs and bathroom equipment. We have one standard room (#14)and one deluxe bunk bed room (#13) to accommodate pets. Pet fee is $15 per night. Once these rooms are filled we cannot make exceptions for pets in other rooms. See our policies for further information about accommodations for your pet.